Alternanthera Forssk., Fl. Aeg.-Arab. 28. 1775. Boiss., Fl. Or. 4: 996. 1879; Hook. f., Fl. Brit. Ind. 4:731. 1885; Schinz in E. & P., Pflanzenfam. ed. 2, 16c. : 71 1934. Annual or perennial herbs, prostrate or erect to floating or scrambling, with entire, opposite leaves. Inflorescences of sessile or pedunculate heads or short spikes, axillary, solitary or clustered, bracteate. Flowers hermaphrodite, solitary in the axil of a bract, bibracteolate, bracts persistent but the perianth falling with the fruit, bracteoles persistent or not. Perianth segments 5, free, equal or unequal, glabrous or furnished with smooth or denticulate hairs. Stamens 2-5, some occasionally without anthers, the filaments distinctly monadelphous at the base into a cup or tube, alternating with large and dentate or laciniate to very small pseudo-staminodes (these rarely obsolete). Style short, stigma capitate. Ovary with a single pendulous ovule. Fruit an indehiscent utricle, thin-walled or sometimes corky; seeds ± lenticular. 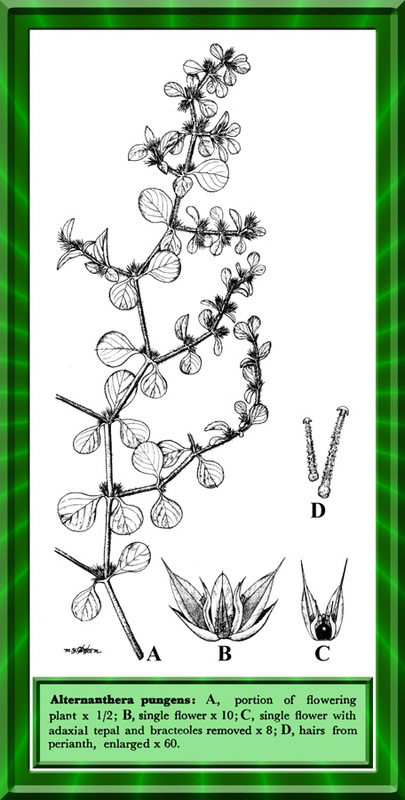 A large and rather difficult genus with over 150 species, chiefly in the tropics and subtropics of the New World, from which region several species have spread to become pantropical weeds. Type species: Alternanthera sessilis (L.) DC., Cat. Hort. Monsp. : 77. 1813. Alternanthera bettzickiana (Regel) Voss in Vilm. Alternanthera nodiflora sensu Stewart = Alternanthera sessilis (Linn.) DC. Alternanthera polygonoides sensu Standley = Alternanthera paronychioides St. Hil. Alternanthera repens* Gmel. = Alternanthera sessilis (Linn.) DC. Gomphrena sessilis L. = Alternanthera sessilis (Linn.) DC. Illecebrum sessile (L.) L. = Alternanthera sessilis (Linn.) DC. Telanthera bettzickiana Regel = Alternanthera bettzickiana (Regel) Voss in Vilm.